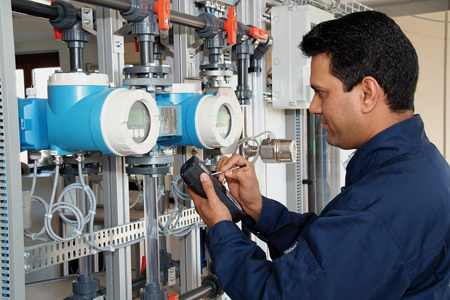 Endress+Hauser experts will survey a plant, document all installed instruments and analyzers, recommend maintenance and calibration procedures, and provide the plant with a complete instrumentation support package. Endress+Hauser introduces the Installed Base Audit program, an instrumentation support program that helps plant managers and maintenance departments identify all the process instrument and analyzer measurement devices in the plant, determine maintenance and calibration procedures for each device, keep the devices and processes running at peak efficiency, and reduce Total Cost of Ownership. The program begins with a plant audit by a trained Endress+Hauser instrument and analyzer expert who, with the help of plant maintenance personnel, locates and identifies every measurement device. The expert enters device and application data into the Endress+Hauser W@M Life Cycle Management database including serial number, tag, manufacturer, location, age, process conditions, and what each instrument or analyzer is measuring (pressure, temperature, flow, pH, etc.). Next, working with plant engineering, production and maintenance personnel, the Endress+Hauser consultant assists in defining the critical points and assigns each measurement device a Criticality Level of high, medium or low. Based on this data, Endress+Hauser presents an overview of the installed base and makes overall recommendations for improving maintenance activities, such as preventive and corrective maintenance, standardization of measurement device, and migration of the installed base to newer and improved devices. The plant gets an organized W@M database with the collected data, enhancing traceability and continued management of all installed measurement devices. The Installed Base Audit helps a process plant make the right decisions to focus maintenance efforts according to their available resources and production requirements, and helps assess the maintenance complexity of older measurement devices. It also allows the plant to resolve the out-of-date plant documentation that doesn’t reflect the current status of installed measurement devices. Advice on methods and intervals for maintenance and calibration—including software tools to view and edit the maintenance plan, and control and document maintenance and calibration work. Through the W@M Life Cycle Management database, Endress+Hauser can provide additional documentation for measurement devices from all manufacturers, including SOPs, operating manuals and configuration details. After the inventory of the plant’s stock, Endress+Hauser creates a segmented list of necessary and unnecessary spares. Endress+Hauser provide alternate ways to cover needs that can lead to stock reduction and reduce aging stock write downs. The Installed Base Audit simplifies measurement device maintenance, helps a plant conform to various regulations and safety requirements, and reduces its Total Cost of Ownership. Endress+Hauser is one of the world's leading suppliers of measuring devices, services and solutions for industrial process engineering. In 2011, the company group recorded sales of approx. 1.9 billion dollars with more than 8,500 employees. Endress+Hauser supplies sensors, devices, systems and services for level, flow, pressure and temperature measurement as well as liquid analysis and measured value recording. The company supports its customers with automation, logistical and IT services and solutions.